The Apocalypse has officially become portable. After accidentally ruining the element of surprise, THQ Nordic have finally confirmed that Darksiders Warmastered Edition will indeed be heading to the Nintendo Switch. The announcement, which was made earlier today, also revealed that the remastered title would be hitting Switch on April 2nd 2019. Darksiders Warmastered Edition will be available on Switch as both a digital release via the Nintendo eShop and in a physical retail format. The remastered title will come with a $29.99 price tag in North America, with European pricing yet to be confirmed. 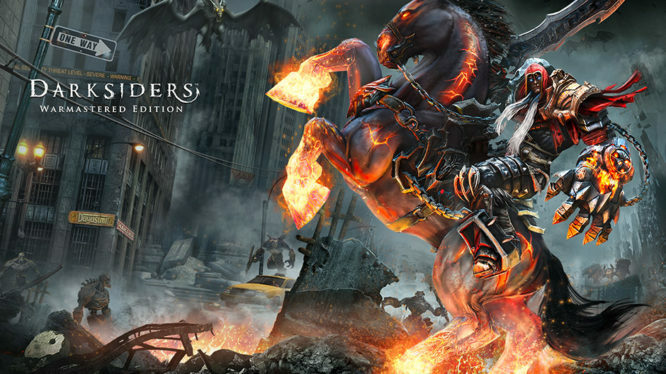 Often cited as being one of the most Zelda-esque game on the market, Darksiders throws players into the troubled world of War – the first Horseman of the Apocalypse. Accused by the Charred Council of breaking the balance between Heaven and Hell, players must guide War through an apocalyptic earth in an effort to help clear his name. The Four Horsemen ride to Nintendo Switch a little bit too early!